Below, the original 1927 image, by Edward Weston. Edward Weston’s image made in 1927. 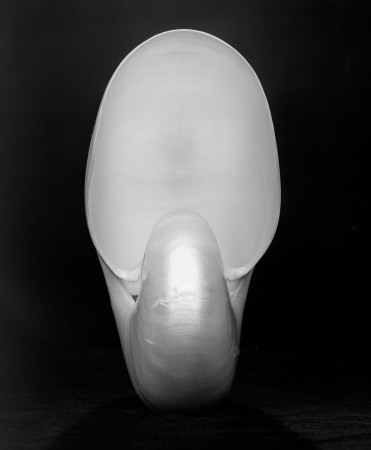 This is the last of the shell images for the time being. Ever since seeing an original Weston print of his shell at MOMA Oxford in the 1970s I have been determined to create my own. I bought the nautilus in the 1980s; it has been preserved until now when the acquisition of my own 8×10 camera has at last enabled me to experience some of the feelings and anguish that Weston did back in the summer of 1927. In acquiring this image, and those others in the series, I certainly went through some of the trials he did; lack of stability, vibration during the long exposure (although nowhere near as long as his*), uncertainty over the best angle and positioning, and more. I have lost the ‘important end’ in my image. With more time and greater determination I could have supported the shell differently, but I had to dismantle the set-up to make way for another subject that could not wait. More of that later, hopefully. 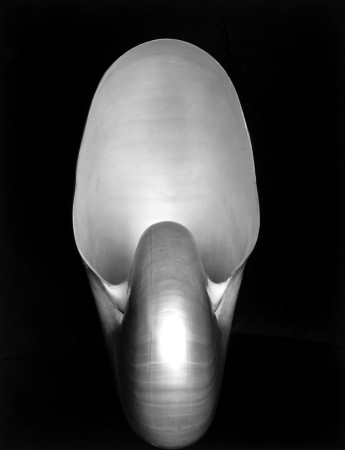 I think I will return to the shell one last time though, seeking that illusive ‘end’ and exploring different lighting. Until then the shell will wait, as it has done for the last thirty years, surviving against all odds but now very fragile. Once I have what I seek its work will be done. *Weston’s exposures were in the order of four hours, mine considerably shorter. This last image had 4 minutes exposure at f45 and was processed in my usual PMK developer, 1+2+100, for 11 minutes at 20°C. Spot the difference! Pity he got there first, but a you’ve risen to a great technical challenge.